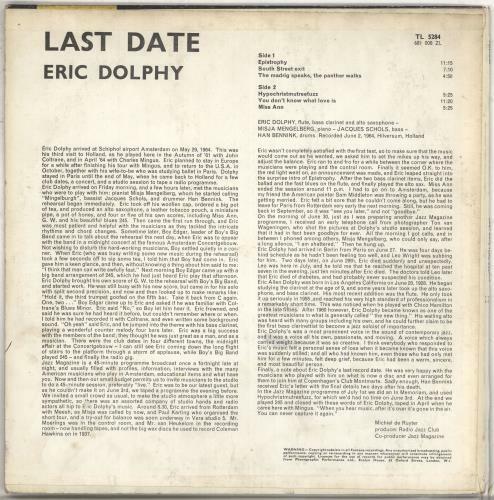 ERIC DOLPHY Last Date (Very rare 1964 UK 6-track mono LP on a rough textured black & silver Fontana label, the last recorded concert from the legendary modern jazz artist [Dolphy passed away at just 27], recorded on June the 2nd that year in Hilversum, Holland, with Misja Mengelberg [piano], Jacques Schols [bass] & Hank Bennink [drums], pasted laminate picture sleeve. The sleeve sho signs of shelf wear around the edges & back [nothing excessive], and, aside from some light spindle wear, the vinyl is in Excellent condition with just a few faint hairlines visible TL5284). 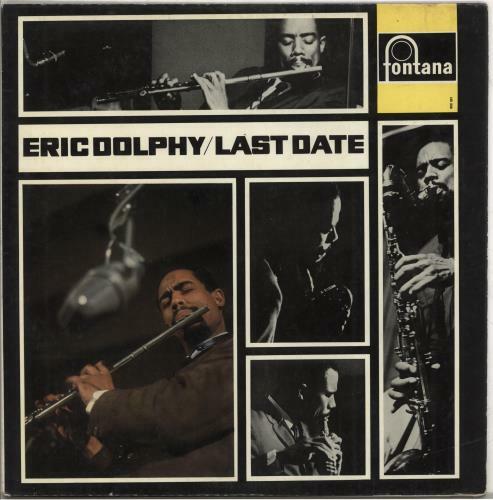 or visit our Eric Dolphy image gallery.